Many of us have seen news reports in recent days on student walkouts in the Denver suburbs. The School Board wants to ensure that certain traditional areas are still emphasized in American history, while the students see the intervention as propaganda. The adults involved seem a bit shocked that what they see as facts is seen by high school students as an attempt to manipulate their belief systems. Why can’t the students properly understand who the People in the White Hats are in this controversy they seem to want to ask? I think it would help if everyone understood high school is too late to introduce facts and knowledge into a curriculum that has long been about shaping values, attitudes, and beliefs in desired directions. The federal ed lab in Aurora, Colorado, McREL, after all, originated the transformational concept in K-12 education of Second Order Change http://www.invisibleserfscollar.com/second-order-change-why-reform-is-a-misnomer-for-the-real-common-core/ many years ago to force irreversible change in students’ worldviews. We can only repair the damage done if we appreciate what has happened in our schools and why. It relates to the e-Governance we started looking at in the last post as well as the creating the shared visions and collective purposes needed to effectively bind the individual to the decisions made by others. In his 1999 book The Double Helix: Technology and Democracy in the American Future, Edward Wenk laid out the new vision of politics our students are actually being prepared for. Government is to be “considered as a steering system and not simply a power broker.” This fits, attentive readers will remember, with the admitted use of conceptual understandings and the manipulated social construction of reality to create an invisible steerable keel in the students who are tomorrow’s citizens. Student-centered learning then instead of the subject-centered emphasis of old is necessary to build that keel. The ultimate consequences also fit with what Hayek warned us of in the previous post. When the School Board tries to interject facts into the classroom, without appreciating that the keel is already there, it becomes easy for the adults closer to the classroom, who know what they have constructed over years, to steer the outrage. Facts=Propaganda if the Keel is already in place without parents, students, and most taxpayers knowing it’s there. Why is it there again? Ultimately, this generation of adolescents is being and has been primed to regard politics as a term used to “describe how elements of a diverse society use their power to bargain collectively, then strategies and tactics for their achievement, all within an agreed upon set of values and rules of engagement. This is American society in action.” That’s the vision of American society and politics the students are acting on, while the school board is still locked into a vision of traditional representative government. “Consensus must be generated” so that governments can steer with a “high degree of harmony” towards a vision of Equity and social and economic justice for all. Many K-12 and college students have been thoroughly embedded in this vision for years. The Common Core is merely a means to make sure it is in place everywhere. Public or private. Suburbs, cities, or rural areas. To align the US with what is going on in other countries towards the same ends. We adults are the ones who simply assumed that the education template had continued on much as it had previously been. Once social comity becomes the established goal of the future at all levels of governments, then “social functioning needs a consensus on goals and a mechanism for its generation and fulfillment.” We get that mechanism by K-12 and higher ed signing on, as well as the media, plus “whoever controls technology.” No wonder their related foundations are so involved. ICT generates the visual images that serve as a “kaleidoscope” of what the future might be and are not bound by whatever has successfully existed before. Wenk wanted everyone to recognize that “Government is not mainly or the only machinery of governance. In American democracy, everyone should consider themselves part of government rather than holding it at arm’s length and figuratively holding the nose. Only by engagement through enlightened civic literacy, civic discourse and commitment can the diverse needs and desires of all be negotiated.” Hence the C3 Social Studies Framework and CCSSO prescribing desired Citizen Dispositions. As someone deeply steeped in history, this is a prescription for disaster, which is why accurate knowledge of the past is no longer being encouraged or much tolerated. It’s essentially the vision of the future and our new obligation to function as a collective that Richard Falk (of the Carnegie and Rockefeller-funded World Order Models Project) laid out recently here http://greattransition.org/publication/changing-the-political-climate-a-transitional-imperative . The new APUSH Framework and the La Pietra Conference we looked at in that trilogy of posts make much more sense when we are aware of a well-funded and determined effort across decades “about moving from the here of egoistic state-centrism to the there of humane geo-centrism.” Since Falk’s angry quotes at the time of the Boston Marathon bombing show he in no way wants a reality of hate to get in the way of his vision of the future, we can be sure that today’s tragic videos of sliced off heads will not change the vision either. It is up to us to recognize it. Whether most of us are aware or not, Falk, the OECD, the UN entities, and public officials at all levels are pushing education and land use regulations designed to create the “citizen pilgrim” who “combines the identity of a participant in a community and the acknowledgment that the desired community does not presently exist, that its essential nature is to bond with a community that is in the midst of a birth process.” No wonder those Denver high school students believe accurate facts from America’s past constitute propaganda in the present. They are participating in a birthing process and many may hope to become midwives of it. No wonder we just keep encountering a required communitarian mindset lurking behind actual definitions of being Career Ready or having a Positive School Climate. The good news in all this is that these students have been consciously subjected to behavioral engineering so that they will have Growth Mindsets that are malleable to change. They are only irreversible if parents, taxpayers, future employers, and the students themselves remain unaware of the deliberately constructed Worldview. That they were subjected to fuzzy math and Whole Language precisely so that their perceptions could be manipulated. The key to deconstructing the keel is to know it is there. The key to defeating these open declarations of a planned transition to collectivism is knowing they exist. 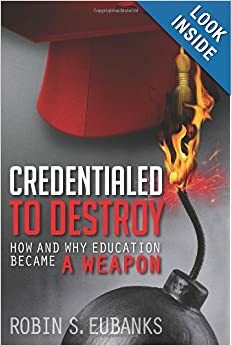 Consider this post as joining my book Credentialed to Destroy: How and Why Education Became a Weapon to be clarion calls towards defeating these collectivist aspirations. While there is still time. Sounding the alarm truly is the beginning of the way back from the precipice. Now before anyone accuses me of introducing the T word without sufficiently laying a proper foundation let’s remember that Hayek was writing from personal experience of One Thing Leading to Another. Secondly, if I had a dollar for every time the books or papers I read now used phrases like “shared vision,” “collective aspirations,” “consensus essential for democracy must be built,” or “unified social purpose,” I could head to the beach for some R&R. We saw it embodied in the goals of both the Rockefeller-funded Communication for Social Change and the Club of Rome-created Structured Design Dialogue to produce common political will. Lighting dollar bills afire is one way to describe the likely consequences of that vision or an excuse for borrowing more from the Chinese. Speaking of which, the second book I mentioned enthusiastically advocates that the West adopt the Chinese vision of state-directed capitalism. Anyone think there might be a connection to the Chinese willingness to fund US deficit spending to push an ICT-centered vision for meeting citizen needs and achieving social justice for all? The Fourth Revolution: The Global Race to Reinvent the State also came out in 2014 and it’s laying out a comparable blueprint to Chopra and Accenture. If we could shift government by acclamation anymore, we would be close to a global fait accompli. I think we have a Convergence of visions here around what the purpose of citizenship will be going forward globally. I think we Americans are taking too much solace in the protections of the US Constitution when it’s obviously seen as just another old document that can be bypassed now by many powerful decision-makers, here and globally. I think we are dangerously assuming the world will continue as it has been despite so many open proclamations. If enough people had simply read what I have documented, they would immediately see how much danger we are in if we continue unaware. It usually takes three taps for me to write about a painful topic. I listed two 2014 books here and I found the Accenture materials later. The third book is called The Double Helix: Technology and Democracy in the American Future. Unfortunately, it fits with the later books even though it came out in 1999. Fortunately, I am aware of its aspirations for us as well and we will cover that in the next post. The non-science types like me though should appreciate that the reference to the Double Helix is all about how to force cultural change. Really starting to hate that word. I tend to come at the same issues from a different approach in part because I usually pick up on all the terms that have quietly acquired a non-dictionary meaning. The real definitions completely change what people are actually admitting they intend to do. When it comes to history now, at whatever age, approach all courses or activities, even for elementary students, with a recognition that “Personal Transformation on our Minds” is the motto crooned to the tune of “Georgia on My Mind”. You will never be far off from what the real goals are. Facts are really only important in this view of history if they can be used to shift how we see ourselves or others in the present. Did you know that historian Thomas Bender (he actually seems to prefer the term Humanities professor) from the previous APUSH post and another NYU historian (now Harvard) Walter Johnson, also at La Pietra, have each been fellows at the Center for Advanced Studies in the Behavioral Sciences since the Conference and before the formal relationship with the College Board began? History as a tool for altering human behavior in the present certainly puts the purposes of that otherwise mystifying Conceptual Framework in a new light, doesn’t it? Compliant is probably a more apt description for the new desired attitudes, but the soothing PR sales pitch in the report is that “education so conceived is concerned with the development of rich and many-sided personalities capable of co-operating.” Education that continued to focus on subject-matter content would simply “intensify the conflicts, contradictions, maladjustments, and perils of the transition.” Just thinking of us then is why we have been lied to about what has been really going on. The view that school could become primarily a matter of social adjustment and experiences while the real purposes hid behind continuing use of Academic Course Names has been on the record for a very long time. That’s because it’s the Flyv Social Science definition of understanding as grounded in subjective experience and how the student learns to perceive it using the provided concepts and disciplinary Big Ideas. I will pull one more nerdy word out of Robin’s Magical Glossary of Pertinent Education Terms: phronesis. Every time you see the word ‘understand’ from now on having to do with what students are to ‘know’ it means grounded in experience and perception and not logic or facts. A phronetic, Arational understanding is what the social scientists and educators intent on fundamental transformations call it and we should appreciate it is not a fact-grounded, analytical sense of the word ‘understanding.’ Is APUSH making more sense now? How about if I add that Bender’s 1978 book Community and Social Change in America explained the now close relationships between sociologists and historians to create a means to “illuminate the dynamics of a complex society.” To use historical data and sociological ideas to examine “the ways in which the roles, statuses, and identities held by individual Americans changed over time.” Now that’s a view of the purpose of history that would fit right in with a Global Civilization Project interested in bypassing the factual history that might preserve the legitimacy of the nation-state. Instead we quietly build up senses of entitlement and grievance in social movements. If that sounds like Bender is interested in fostering the kind of communitarianism we just keep stumbling across in the actual Common Core implementation, I think that is exactly right. It would also explain all the foundation sponsorship of the La Pietra Conference. It is history as a social practice of students and teachers acting as a community to explore the past to better appreciate what is wrong with the present. I have one more place I want to look to put APUSH into perspective while once again encountering the communitarian emphasis that never seems to be far away from what will be imposed on students in a K-12 school or classroom. The goal always seems to be to accustom each student to a more communitarian, interdependent approach in society and the economy. This book from 1992, Responsive Schools, Renewed Communities, is by Clifford W Cobb, a co-author of the very troubling for the common good, with a Foreword by famous communitarian prof Amitai Etzioni. It actually advocated for vouchers and charter schools and school choice generally as a more reliable vehicle for achieving the communitarian focus. That surprise would suggest I am not the only one who understands that accreditation is the monkey wrench that undermines genuine choice for parents. So beware what remedies we advocate for without reading the footnotes and small print. My purpose for using that book is how well it fits with the template from both the 1934 Report and the methods for transformation of political community laid out in Contending Sovereignties. That 1992 book wanted schools that depend on “fostering concrete experiences of commitment to an immediate community. Those experiences can then be generalized into a devotion to the common good.” School becomes a means to “generate allegiance to core values,” which would of course put it in line with the global education template UNESCO and Pearson are quietly pushing. I think that is what all education at every level globally is now geared to if, like me, you know where to look. We have been looking at an astonishing consistency of aims now from a huge variety of starting points and assumed affiliations. Next I will walk us through how history is actually to be used before APUSH to get to the Global Civilization Project goals. Ready for the assessment to be a class quilt?